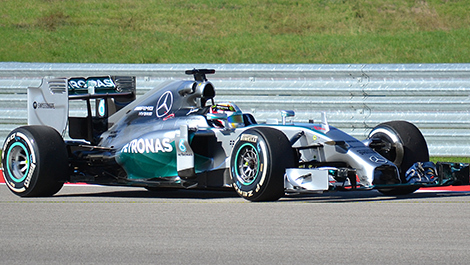 A Formula 1 car travelling at high speeds generates massive downforce - a vertical load that pushes the car down to the tarmac. We prove it here with two photos. An F1 car works like an inverted wing located close to the ground. The diffusor located at the rear of the car creates suction while the rear wing pushes the car down because of the difference in air pressures. At high speeds, the rear axle of the car is submitted to a vertical force that reaches something like 1000kg. 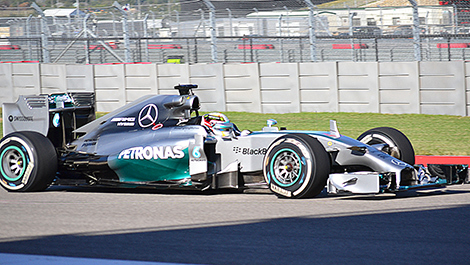 While in Austin for the US Grand Prix, I took two very interesting photos of the Mercedes W05. The first photo was taken between corners 10 and 11, before the hairpin, when Lewis Hamilton almost stopped his W05 on the race track to find a gap in traffic. We can see the impressive rake of the car when it's not moving (the rear end is located quite high in the air). I took the second photo underneath the bridge that is located between turns 2 and 3, where the Mercedes was running at some 280 km/h (according to the FIA map of the circuit). Notice how low the rear end of the car is. The downforce was powerful enough to completely squash the rear suspension. The ride height of the rear end is reduced to just a few millimetres.